“Montreal Jew sells concentration camp soap”, says today’s Ynet. Abraham Botines, the owner of a World War II collectibles shop, is under fire for selling bars of soap made in 1940 Nazi death camps. The items are for sale for just $300. Botines, 73, the holocaust souvenir merchant, is the owner of a small antiques shop in Montreal and has recently added the soap, made in the concentration camps in Poland, to his list of collectibles. The Spanish-born Jew sells numerous items from World War II, including Nazi soldiers' former belongings. Apparently, his recent decision to sell soap from the concentration camps has evoked the anger of many members of Montreal's Jewish community. I am left puzzled here. I really fail to grasp the holocaust exchange rate. Apparently, to ethnically cleanse Palestine in the name of the holocaust is ‘totally fine’. To keep Palestinians in concentration camps, starve them and pour white phosphorous over their heads in the name of the shoa is ‘kosher’. To invade Iraq or nuke Iran in the name of Jewish suffering is ‘totally acceptable’, yet, pocketing $300 out of a ‘shoa soap bar’ is regarded as a crime by some Jews in Montreal. Botines says he is not selling the items to promote Nazi propaganda, but to “preserve the memory of the Holocaust”. I think that this is totally reasonable. For just $300 you can have your own holocaust museum in your bath cabinet. 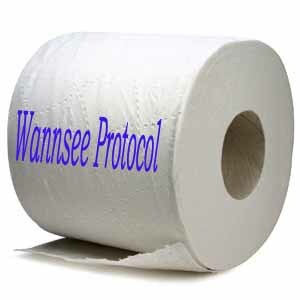 I guess that it is just a question of time before we have the Wannsee Protocol on toilet paper available for general consumption. It is now a widely accepted fact that the Nazis didn’t make soap out of human fat*. However, one crucial question is left open: what kind of people can come up with such a horrible phantasmic tale? What kind of people invent a story in which other people transform them into soap? * Bill Hutman, "Nazis never made human-fat soap," The Jerusalem Post - International Edition, week ending May 5, 1990. "Holocaust Expert Rejects Charge That Nazis Made Soap from Jews," Northern California Jewish Bulletin, April 27, 1990. (JTA dispatch from Tel Aviv.) Facsimile in: Christian News, May 21, 1990, p. 19.